Pasteis de Belem (Lisbon Egg Tarts) | Simple. Tasty. Good. 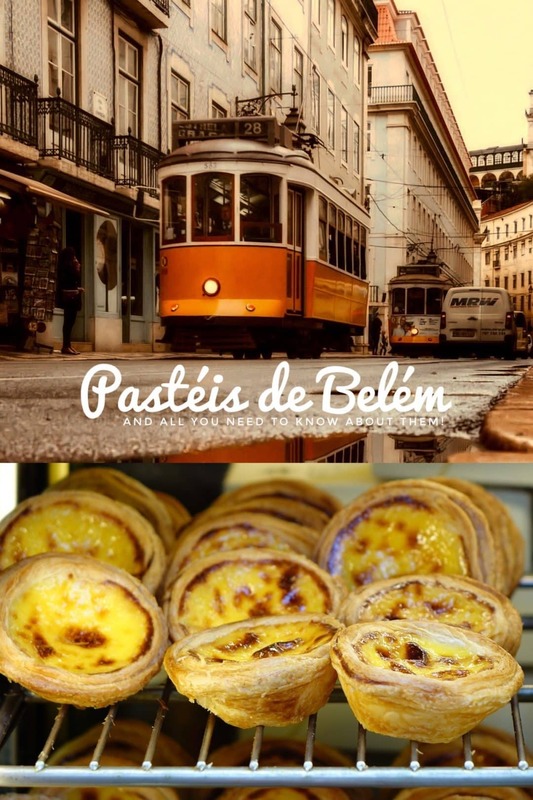 You can’t possibly think ‘Lisbon’ without thinking ‘pasteis de Belem‘. 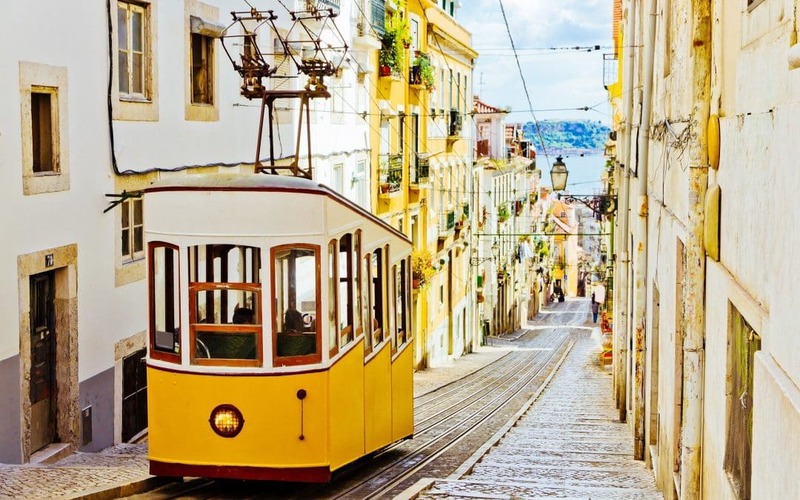 Don’t you visit lovely Lisbon without ever tasting one! Because you won’t regret it. As soon as you’ve set your teeth in a pastel (pastéis is plural), you’ll see why. Normally when someone answers positively, then my next question usually is: and what’s favorite Portuguese dish? As much as I love a good cataplana (a Portuguese seafood stew), a caldo verde soup and the classic stir fried salt cod with eggs and potatoes also known as bacalhao a bras… my absolute favorite will always be porco a alentejana. This delicacy consists of crunchy chunks of pork tenderloin in a cilantro sauce with fresh clams… Needless to say that this dish is just absolutely to die for! 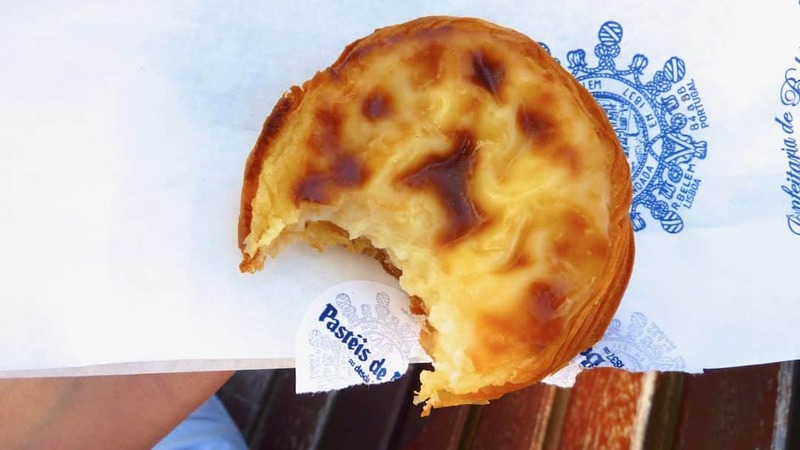 So where can you find the authentic pasteis de Belem in Lisbon? 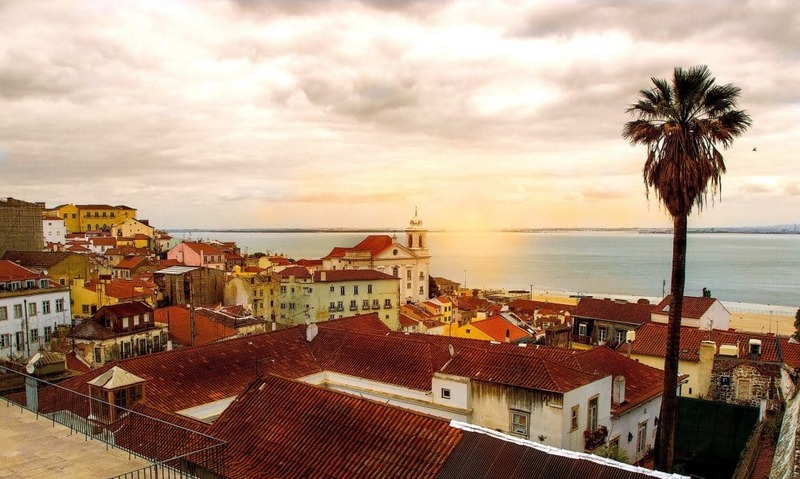 The parish of Belém (Portuguese abbreviation for Betléhem) is located west of Lisbon’s city centre near the Tagus river. Take tram 15 to Belém (there’s no subway stopping there) and get off at Belém-Jerónimos. The Jerónimos Monastery a little further down the road (now housing the Maritime Museum and the National Archaeology Museum) is the beating heart of it, another reason why this location is worth a visit. Somewhere between 1700 and 1800 the monks of this monastery created the pasteis de belem. Later on the recipe was patented. The monastery was closed on 1833 but the production of the egg tarts was relocated a little down the road in Casa Pastéis de Belém where you can still find it now. People also call the pastel de Belém ‘pastel de nata‘, which literally means ‘pastry that contains cream in Portuguese. It closely resembles a flan or egg custard tart. But it’s got that little extra. The dough is truly the most crunchiest I’ve ever bitten in. How delicate! How buttery and yet so tremendously flaky! I can still hear that crunch when I devoured one. It is not your typical puff pastry, that’s for sure. It comes close to phyllo dough. I guess that the cooking time is perfectly timed because you will incinerate this kind of pastry if you left it in the oven for 30 seconds longer. And then you got the creamiest eggy custard filling ever. There’s egg yolks, sugar and cream in it for sure. And I also taste some salt and vanilla. Others think there’s some kind of starch in it (corn or potato) which I doubt. But the true composition and ratio between these main ingredients of the pasteis de belem, we will never know. A well kept secret recipe. Only a handful know it. The monks passed the recipe on to the owner of a local baker’s shop who started baking the tarts and selling them in his shop. This shop still exists nowadays and has been run by the same family for nearly 200 years. I read somewhere that nowadays only one family is in possession of the recipe and only 3 members of that family know it by heart. By heart indeed, I once read that the recipe is memorised instead of written down to avoid it being found or stolen. Another funny thing is that these people who know the secret can never travel together let alone meet each other just in case there’s an accident: plane crash, car accident, a bombing or even a building collapsing… Great. Ever since tasting the real pasteis de Belem, I have been looking for the perfect recipe to make them at home though. I know, that sounds pretty much impossible. The first time I tried it, I failed miserably. And by that I mean bug time. No matter how much I did my homework, the egg tart didn’t taste anywhere near the original one. Well I guess that’s the disadvantage of having tasted the very best pasteis in the world I’m afraid. So all I can suggest is to get over there, follow the inevitable crowd and queue near and in front of the baker’s shop and go for it. Or try the recipe below! Back to the shop first. I paid €1,05 ($1,45) a piece a few years back. So prices might be higher nowadays. You can sit inside (pretty noisy though) and devour your pasteis de Belem sprinkled with cinnamon and icing sugar and accompanied by a cup of coffee. Or just walk to the park out front like I did, sit down on a bench and enjoy this creamy treat in the shade. 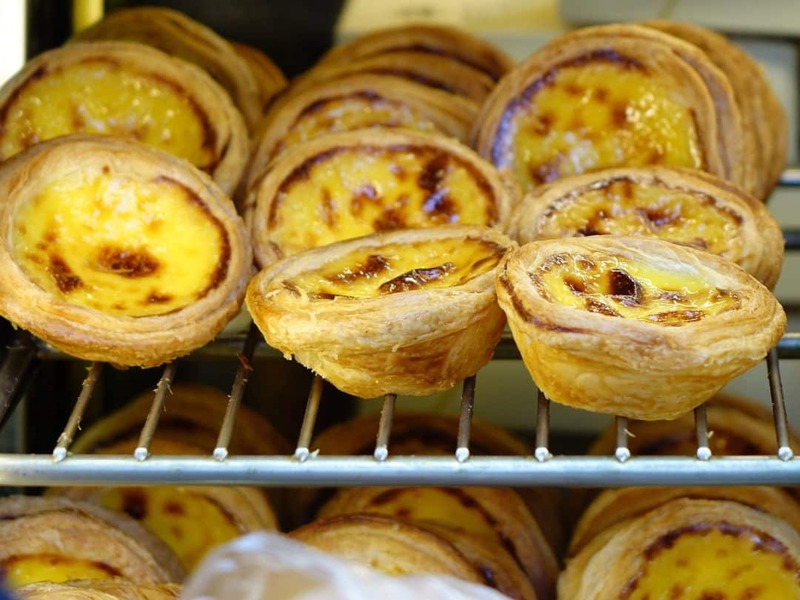 Just don’t wait too long: eat your pasteis de Belém preferably lukewarm… Because the egg tarts are best eaten fresh for the best flavor and crunch experience. And you can be certain that the ones you buy ARE fresh: the shop sells close to about 25.000 of these egg tarts a day, which means that the ovens are working constantly. In peak season, the bakery even bakes up to 50,000 tarts a day! What about the other bakeries in town? True, you will find the pasteis de nata everywhere in Lisbon. Are they any good? Sure! But. I’ve tried many of them while in Lisbon and the best ones are still the pasteis de Belem. Why? Because it’s simply the best pastry and the best filling. Lots of pasteis de nata are made with shortcrust pastry or similar. And their custard filling can be a bit rubbery and artificial (too mush flour or starch added) instead of creamy. The pasteis de Belem are simply the best. I am not going to lie: making pastry from scratch for pastels de Belem is a harrowing and time consuming job. I once made puff pastry and quite frankly, you must be super brave to do that more than once. So that’s why I opt for a much easier or less authentic way to make pastels: with store bought puff pastry. Are you still in for a rainy day baking experiment? Then check out this recipe on Eater: it’s one of the best written recipes on how to make the pastry for these pasteis de Belem. Puff pastry down. Custard filling to go. The ingredients are quite straight forward: milk, sugar, egg yolks, vanilla bean, cinnamon stick and lemon rind. Not all recipes use the rind but I like the fresh touch it gives without making the custard lemony. I didn’t change the recipe too much because making custard is one of those basic cooking techniques that succeed or fail. Better follow the rules. Grease a 12-hole muffin tin with butter. Then put it in the fridge. Preheat your oven, preferably about 527°F (275°C). Add the milk, water, cinnamon stick, vanilla bean, sugar and lemon rind to a saucepan. Place it over medium heat. Simmer the milk until the sugar has dissolved. Then take the pan off the heat. Let the ingredients infuse for 5 minutes. Discard the rind, vanilla and cinnamon. Add the egg yolks to a large mixing bowl and whisk until pale and creamy. Then add a tablespoon of warm milk to the egg yolks (make sure it's not piping hot) and whisk vigorously. Keep adding a couple of other separate tablespoons of milk and whisk in between. Then slowly add the remaining warm milk to the bowl. Keep beating the eggs. Now add the custard mixture to a clean saucepan and place it over very low heat. Keep stirring gently but constantly with a spatula. Don’t let the custard burn. Be patient. The custard needs quite a few minutes to thicken. Don’t turn the heat higher to speed things up or it can split. As soon as the custard has thickened to the consistency of double cream, remove it from the heat and cover the surface with cling film. Cut the puff pastry sheet into 12 discs and place them in the buttered muffing tin. Divide the custard over the tart case. Carefully put the tray in the hot oven. Bake the pasteis for about 10 to 14 minutes until the custard is caramelised on top. Then remove the tarts. Sprinkle with icing sugar and cinnamon. Serve lukewarm.